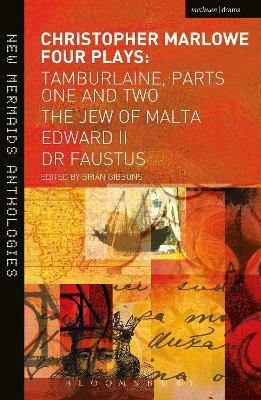 This New Mermaids anthology brings together the four most popular and widely studied of Christopher Marlowe's plays: Tamburlaine, Parts 1 and 2, The Jew of Malta, Edward II and Dr Faustus. The new introduction by Brian Gibbons explores the plays in the context of early modern theatre, culture and politics, as well as examining their language, characters and themes. On-page commentary notes guide students to a better understanding and combine to make this an indispensable student edition ideal for study and classroom use from A Level upwards. Christopher Marlowe (1564-93) was an English playwright and poet, who through his establishment of blank verse as a medium for drama did much to free the Elizabethan theatre from the constraints of the medieval and Tudor dramatic tradition. His first play Tamburlaine the Great, was performed that same year, probably by the Admiral's Men with Edward Alleyn in the lead. With its swaggering power-hungry title character and gorgeous verse the play proved to be enormously popular; Marlowe quickly wrote a second part, which may have been produced later that year. Marlowe's most famous play, The Tragical History of Doctor Faustus, based on the medieval German legend of the scholar who sold his soul to the devil, was probably written and produced by 1590, although it was not published until 1604. Historically the play is important for utilizing the soliloquy as an aid to character analysis and development. The Jew of Malta (c. 1590) has another unscrupulous aspiring character at its centre in the Machiavellian Barabas. Edward II (c. 1592), which may have influenced Shakespeare's Richard II, was highly innovatory in its treatment of a historical character and formed an important break with the more simplistic chronicle plays that had preceded it. Marlowe also wrote two lesser plays, Dido, Queen of Carthage (date unknown) and The Massacre at Paris (1593), based on contemporary events in France. Marlowe was killed in a London tavern in May 1593. Although Marlowe's writing career lasted for only six years, his four major plays make him easily the most important predecessor of Shakespeare.